Real Time has been providing alternative and holistic pain relief to their customers for 20 years. Their products are safe and effective and work fast to alleviate pain and discomfort from such ailments as arthritis, muscle soreness, foot pain and cramps. They have a variety of targeted pain relief products including a Real Time Pet Formula made especially for your four legged family member. When I was approached to review Real Time Pet Formula I thought it couldn't have came at a better time. 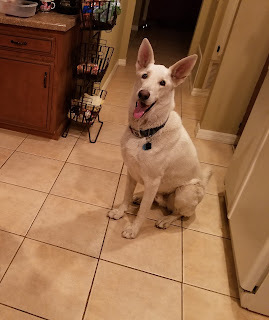 My family has been blessed to share our home with Timber, a large white German Shepherd that we have loved for the last 6 years. He is a big guy, long-limbed, and recently we have started seeing him show signs of discomfort when getting up after long periods of laying down. He is a little slower and a bit wobbly at first. We have also seen him limping a bit. All of those things are often seen in German Shepherds who are prone to arthritis and inflammation of the joints as they age. Discomfort is usually found in their hips and elbows, and while Timber does not have full on arthritis as of now, we do see that he is displaying signs that he is a little uncomfortable at times. Poor guy. Arnica for relief of pain, soreness, stiffness, bruising and swelling. Aloe Vera to soothe, and provide hydration and relive dryness and itching in skin. Willow Bark which contains a chemical called salicin which works like aspirin. Emu Oil, a great skin moisturizer that contains vitamins E and A. It is simple to apply, you simply part the fur and spray directly on furry friends skin and relief is almost immediate. I have been using it on my big boy when he comes in from running around our large yard and wants to rest. He must like it because when I initially approached him with the bottle he would cower away. He now lays there and lets me spray and massage Real Time on him and even shows me his belly as approval to which I happily give him a few rubs and scratches. You can win a bottle of Real Time Pet Formula! This giveaway is open to US residents. Please leave a valid email address if it is not visible in your profile. I would love to win for my twelve year old cat! My GS has bad hips she is over 10 a rescue and this would be wonderful to try on her. This would be great for my pooch! This sounds amazing & definitely wanna try for my furbaby Daisy Mae who also has arthritis! The ingredients sounds amazing & natural with ease of putting on your pet! I would like this for my rottie mix who has hip pain. Out cat Tom could use this. I have a 12 year old Boston who I would love to have this for. This would be great for our Zack. Thanks for the giveaway! I would love to win for our Rusty. I would like to win this for my dog Bella. She is a bigger girl and has been having a lot of problems with her left back leg. Like what you are describing-stiffness after laying around and limping. I feel so bad for her and I would love to try this to see if it helps her. My grandchildren absolutely love our cooI, Shih Tzu, who could use the.Real Time Pet Formula. I have grandchildren that definitely like our amazing, Maltese and want to help with the Real Time Pet Formula. My nieces and nephews really enjoy our marvelous Russell Terrier that really needs the Real Time Pet Formula. Our Pomeranian is just wonderful for all of my grandchildren, but there is a need for the Real Time Pet Formula. I have nieces and nephews that alwatss like our fabulous Boston Terrier, who would like to have the Real Time Pet Formula. My many children just adore our awesome Pekingese, but the Real Time Pet Formula would be useful. Our pupper has had an issue since being fixed where he gets skin irritation. Usually doesn't seem to cause him any pain but this would be nice to have on hand for the times that it does. I would love to win this prize for my bulldog. I would love to win this for my baby girl. She is a 14 yr old Shih Tzu. I need to find something for her. I have been giving her infant Tylenol for her pain & restlessness. My senior dog would be most appreciative to try out this product. Thanks for the chance. I would love to give this to my friend. I would like to win!! I have a couple of furbabies that could use this. I would love to win this for my fur baby! I’d like to win this for my sisters dog named Grimm who has hip and joint pain! He’s a 14 year old black lab! I would like to win to donate to Boston Terrier Rescue. I'd like to win. Thanks. Of course I'd like to win! Thanks for the chance! I would like to win this for my dog for his hips. I would like to win. My dog has arthritis in her knees. This would be great for my Roxi!